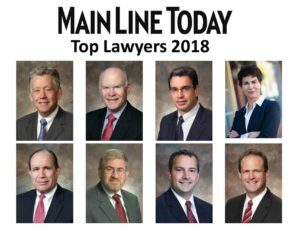 Norristown, PA, July 31, 2018– High Swartz LLP, a full-service law firm with offices in Norristown and Doylestown, Pennsylvania, is pleased to announce that 8 of its attorneys have been named among the “Top Lawyers” for 2018 by Main Line Today magazine. The annual list of Top Lawyers in Main Line Today highlights top attorneys in Chester, Delaware and Montgomery Counties. The attorneys are nominated via peer balloting and then vetted through Main Line Today’s editorial process.